Are Quartz Kitchen Countertops Really For You? Made from one of the hardest minerals on earth, quartz kitchen countertops Dallas are arguably the most durable option. They are also some of the most eye-catching. They come in a wide variety of colors, (e.g. browns, blacks, creams, etc.). But unlike natural stone, which are mined, quartz is engineered in a factory. Their primary ingredient is ground quartz (about 94 percent), combined with polyester resins to bind it and pigments to give it color. For some designs, it is possible for small amounts of recycled glass or metallic flecks to be added to the mix. The resins, in particular, help make these counters stain and scratch resistant—and nonporous, so they never need to be sealed. Quartz is quickly becoming one of the most popular countertop surfaces among homeowners and designers. This beautiful man-made material is definitely here to stay. And mind you, kitchen countertops in quartz offer a number of positive features like consistent beauty, extreme durability, and almost no maintenance. And while they are relatively new, but quartz kitchen countertops in Dallas found a loyal following because of their many good qualities. In fact, they do not have some of the weaknesses of natural stone. Quartz is a manufactured product and can be very attractive. The manufacturing process allows a much wider range of colors than you will find in natural stones such as marble or granite. The appearance of the finished engineered stone is rich and even luxurious. The finish has a depth that cannot be produced by other countertop material. Moreover, quartz kitchen countertops have the same durability granite, but are quite a bit more forgiving. Hence, it will not chip or crack as easily. It does not have the same hardness in the feel that some people find unpleasant. In addition, quartz is non-porous, and thus effectively resists staining much better. It even stands up to juice, oil, wine, tomato, coffee, and other sources of stains in the kitchen. For cleanliness, a non-porous surface means that it will not harbor bacteria or viruses. You can always be confident that you are getting your Dallas’ kitchen countertops in quartz absolutely clean, and that is a great benefit to have. Furthermore, quartz kitchen countertops are very low in maintenance. It never needs to be sealed. Just wipe with soapy water for daily upkeep. Surface stains can be removed with a gentle cleansing scrub. Avoid scouring pads, which can dull the surface, and harsh chemicals that could break down the bonds between the quartz and resins. 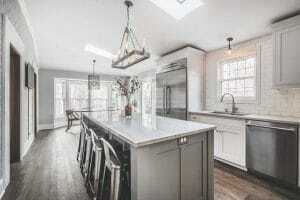 Looking for the best quartz kitchen countertops in Dallas? Contact us today at Hard Rock Imports. We offer the best quartz countertop material at very reasonable rates. Call us now for a no cost, no obligation design estimate!